В этой главе вы узнаете, с кем разговаривал Роджер Экройд перед смертью и кто встречался в летнем домике в ночь убийства. by the way — try to remember! It is absurd. It is nonsense. Do you mean to say…? Pay attention that go is not the same as go on. How many meetings were in the summer house on the night of the murder? 3.2. According to Ursula Bourne, she was in her bedroom from nine-thirty until ten. Is that true? If not where was she at that time? 3.3. According to Dr. Sheppard, the stranger who he had met near the gate came to the summer house a few minutes after nine. Where did he go? Who came to Fernly Park secretly on the night of the murder? 5. Use the method of deduction and make two logic chains. 5.1. 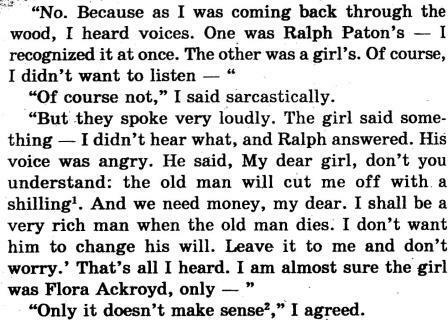 Let us remember the conversation in the wood, which was on the day when Roger Ackroyd had announced the engagement between Flora and Ralph. Do you remeber who threw the wedding ring in the pond? 6. Let us make everything clear. Now we come to another, and very interesting, aspect of the crime. 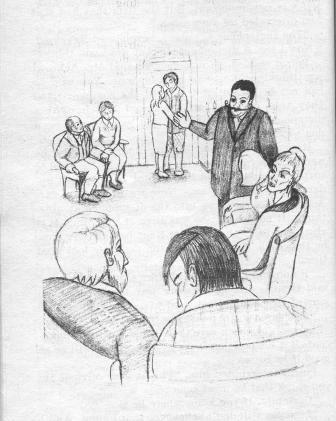 Who was at the study with Roger Ackroyd at 9.30? Not Ralph Paton, who was in the summer-house with his wife, Ursula Bourne. Not Charles Kent, who had already left — you remember, he was in the bar a mile’s distance at 9.45. Then who? And I ask my cleverest question: Was anyone with him? Maybe you are trying to say that I am a liar, M. Poirot, when I say that I heard Mr. Acroyd’s voice. But is is not only my evidence. Major Blunt who was on the terrace also heard that Mr. Ackroyd was talking to someone. You see that there are two witnesses who say that Roger Ackroyd was talking to someone in the study. So, it is proved. 6.4. Who have we forgotten? — Study the list of characters. Who talked to Roger Ackroyd at 9.30? — Your answer. Evidently that that person was the murderer. If you have named the person, you have your own version. Tell us your ideas.